The idea of bringing together the three disparate works recorded here belongs to the composer himself. In April 1786 Emanuel Bach organized a charity concert in his home city of Hamburg that formed part of a series which sought to educate the taste of the new generation of merchants on whom Hamburg’s future fortunes rested. To an intelligent, musically interested audience, Emanuel offered an overview of the great musical achievements of the century. He began with the ‘Credo’ from Johann Sebastian’s B minor Mass, followed by the two best-known movements of Handel’s Messiah ‘I know that my Redeemer liveth’ and the ‘Hallelujah’ chorus. In the second half of the concert Emanuel featured three of his own works, the first of his four Orchester-Sinfonien, Wql 83 (published in 1780), his Latin Magnificat of 1749 , and finally the double-choir Heilig of 1776, his most popular sacred choral work. Before the interval Emanuel demonstrated to his audience the culmination of the great German line of choral polyphony in his father’s great ‘Credo’ — perhaps its first performance — and credited Handel as the creator of a truly ‘European’ oratorio style. After the interval Emanuel established his own place in music history as an upholder of the old polyphonic style alongside the new expressive lyricism of the empfindsamer Stil (Magnificat) while also pioneering an apparently simple and direct new style for church music (Heilig) . But most importantly Emanuel presented himself as an original creative spirit in the bold originality of his symphonic music; music which had a decisive influence on Haydn and the creation of the mature Classical style. The concert was well timed. Two years later Emanuel was dead, resting in peace having made his farewell to the Hamburg public and established his place in history. And this is what we are celebrating this year — the continued vitality of Emanuel’s music three centuries after his birth. ‘Vitality’ is the essential ingredient of the performances recorded here. Everything goes at a lick, rhythms are strongly sprung, and dramatic gestures and illustrative writing in the orchestra are pounced on. 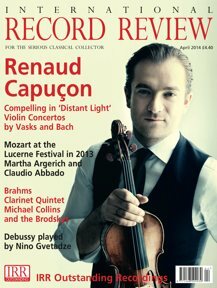 Bach’s comparatively few moments of lyrical repose (like the slow movement of the symphony) are lingered over with due respect, but even here the underlying rhythmic pulse — the tactus beats firmly. Although Bach’s more whimsical, capricious music needs space to breathe, the pieces recorded here are generally well served by being on a tight rein. 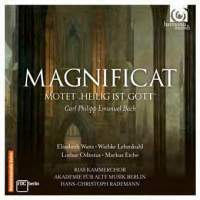 In the Magnificat the bass aria ‘Fecit potentiam’ is driven very fast: its pithy parts for three trumpets and timpani literally punched out, its orchestral responses to the word ‘dispersit’ (‘scattered’) immediate and visceral, and the soloist (Markus Eiche) appropriately edgy and hectoring. At the opposite extreme, the flutes bring an ethereal mellowness to the ‘Suscepit Israel’, and the tempo reduces to a slow heartbeat. Contralto Wiebke Lehmkuhl produces a pleasingly even and precise sound ennobled with surprisingly deep-lying tonal warmth and a lingering consideration. Singing with a more generous vibrato and distinct hints of operatic ambition, Elizabeth Watts shapes her phrases beautifully with a sure sense of direction and intensified with a few improvised embellishments in the second half of ‘Quia respexit’. The four choruses are of exceptional quality, and the RIAS Chamber Choir is at its best in the fugal finale (‘Sicut erat in principio’) , where Emanuel Bach shows his inventiveness by finding yet new things to say about an old fugal theme used by many other composers, including his father, and Handel in Messiah (‘And with his stripes’). This is thrilling stuff, complete with squealing trumpets and a magnificently generated conclusion. However, it’s the orchestral detail which is always to the fore in the recorded balance, with the choir very firmly placed behind the players. In the opening chorus this robs the music of its brilliance and immediacy. There’s loss of detail too: the tenors seem very quiet and even so basic a thing as the final ‘t’ of the opening word ‘Magnificat’ is utterly lost. There are balance problems in the orchestra too. The wonderful horn parts in the tenor aria ‘Quia fecit’ and the tenor and alto duet ‘Deposuit’ are virtually inaudible — a crying shame, and one of the major disappointments here. Finally, though Peter Wollny’s booklet notes are outstanding, we are nowhere told that we are listening to the second ‘Hamburg’ version of the Magnificat rather than the earlier ‘Berlin’ version of 1749. Amongst the many differences I noticed was a completely new setting of the chorus ‘Et Misericordia’. It would have been interesting to know more about the relationship between the two scores, given the context of this programme. The double-choir Heilig (‘Sanctus’), Wq2 17 (1 776) lasts a little under eight minutes but created quite a stir in its time. Emanuel told his publisher that it was his swansong ‘and will serve to ensure that I will not soon be forgotten after my death’ — it kept him alive in the short-term memory, but is relatively unfamiliar today. After a short introductory aria representing the pronouncement of the Prophet Isaiah, the voices of the Angels - (Choir I ) alternate with the voices of the People (Choir 2) here rather effectively managed with spatially separated choirs combining in a triumphant final fugue. The RIAS Chamber Choir really breaks free here — with a slightly better recorded balance than in the Magnificat — and the unexpected, climactic introduction of the slow-moving melody of the German ‘Te Deum’ is handled with great sensitivity cherished gently rather than belted out. The orchestral writing of the Magnificat and the Heilig is so rich and expressive that to finally hear the Berlin Akademie fur Alte Music on its own in the Symphony in D major (1780) feels like a fitting finale. The strings curl and release like coiled whips in the opening Allegro - very fast, very nervy - but occasionally I missed some of the smaller details which I could see plainly in my score. The slow movement should follow without break or pause, but a smooth transition is slightly interrupted here. The combination of flutes and low strings really captures the players’ imaginations, though the delicate plumes of string pizzicato were almost too subtle to hear. The final Presto is dispatched with appropriate exuberance, and the strings perfectly integrate the briefest phrase of self-doubt with which Emanuel spices his otherwise sunny farewell — balsamic vinegar on strawberries.